Linking up again with The Beetle Shack, with another photo from my archives. This is my two sisters & i, this photo was taken in about 1985 - 86. We had just been to our local Show, a huge event in a small country town, where we had all just won "Miss Showgirl". Vanessa & i came equal first in our section & Kristen came first in her section. 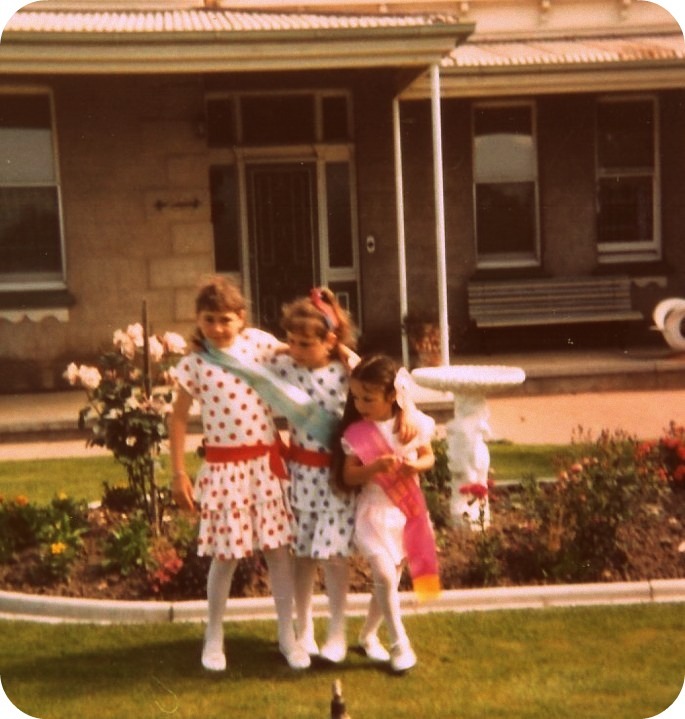 As you can see, we were in co-ordinating dresses that mum had made. Most exciting part was that we made the front page of our local paper the following Wednesday! I love this photo, such a wonderful memory - also because of the fact that it was taken in my Nanna & Nonno's lovely front garden, who luckily for us, lived next door. And yes, Vanessa & i had to walk around with that sash around the both of us, hahaha! I like this photo too. So many memories in the one photo especially Nanna Nonno's house. The perfect lawn and garden to which we were not to wreck. The mud pies we used to make at the corner of the house....hmmmmmm .....memories. this one is winner! i love it!